Twitter Scales Mount Everest. Is Nowhere Sacred? Climbing Mount Everest is one of the most dangerous, physically challenging things a human being can do. You'd think that if there were one place on Earth that could convince people to leave their phones at home, that would be it. You'd be wrong. 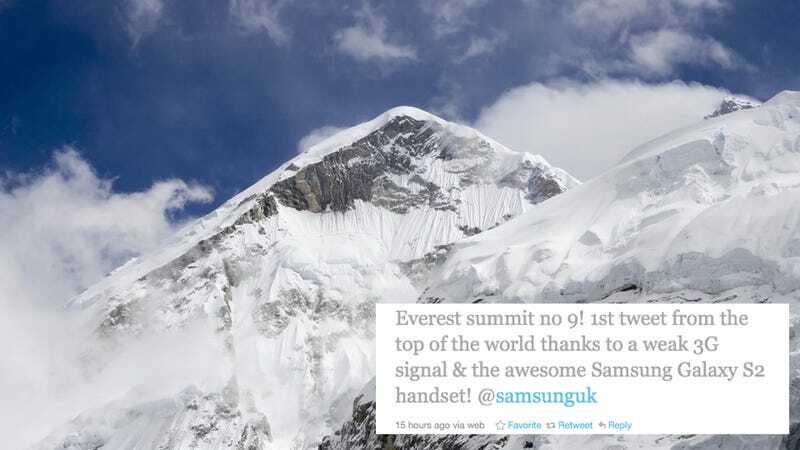 English mountaineer Kenton Cool (no, really, that's his name) made the world's first tweet and video call from the top of Mount Everest yesterday. He used a Samsung Galaxy S II to tweet at SamsungUK, which is using this event to do some pretty smart marketing. It was Cool's ninth time summiting the mountain—kind of impressive considering Everest claims a life for every ten successful summits. Mt. Everest first got 3G coverage back in October. Since then, climbers have been able to tweet to their hearts' content from the mountain, but until now none of them had the onions to bother with Twitter during the Final Push—the last climb before the summit where some of the most physically fit people in the world literally sit down and wait to die.